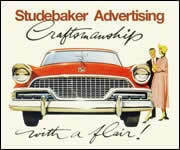 Studebaker made "running changes" to correct various engineering oversights. Thirty cars made in July of 1963 are referred to as transitional or 1963 1/2 models. The largest number of changes were made in August of 1963 and these are considered the changes that defined the 1964 model, however, the company introduced changes throughout the production period. All new models went through this process and the Avanti was no exception. Most of the "running changes" were made to improve flaws that affected basic functions. The most obvious changes in appearance were the rectangular headlight bezels and the solid color interiors. The rear window fastening was redone twice because the window popped out of the frame at speeds above 100 mph! 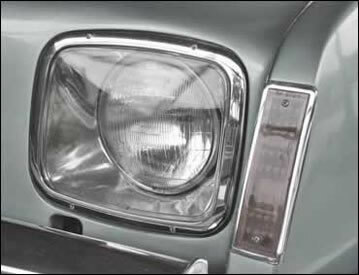 All but a few 63 Avantis have round headlight bezels. Jul 1962 Improved rear window fastening. Sep 1962 Revised rear shock absorbers. Oct 1962 Baffled mufflers available. Mar 1963 Light/heater switchplate redesigned. Rain drip molding added. Jun 1963 Tenite panels and woodgrain wheel phased in as standard. Aug 1963 Rear quarter window latch redesigned. Stronger hinge for console box lid. Console control handles round instead of flat. Rubber door sill plate redesigned. 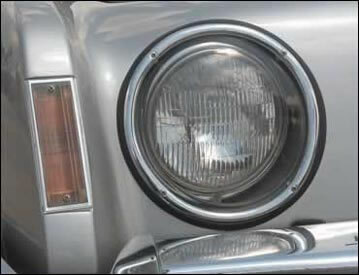 Headlight bezels changed from round to rectangular. Parking lights restyled. Radiator grille added. Hood support moved from left to right. Air intake grille added to left side of cowl. Air duct to automatic transmissions on cars without a/c. Long battery replaced by standard-shaped battery. Valve-lifter cover (center valley plate) painted, not chromed. Inside air intake openings given plastic grilles. Solid-color interiors (including black) standard. Inside door panel "S" emblems standard. Rear window fastening again redesigned. Pleated "Regal" vinyl upholstery standard (previously optional). Perforated delux vinyl upholstery dropped. Carpet option reduced to black only. Fender plate changed to read "Super-charged Avanti" instead of "Supercharged." Sep 1963 Electric window cable shield added to cable between body and door. Manifold pressure guage face redesigned. Thicker padding for bucket seat backs. Dec 1963 Factory announced phase-out of production. (production actually ceased in November).